This year, the U.S. Coast Guard is celebrating the 150th anniversary of its presence in Alaska — or the territory that became the 49th state. The Revenue cutter Lincoln transported the first federal officials to Sitka for the formal transfer of proprietorship from Russia, a ceremony that took place Oct. 18, 1867. Since then, the Coast Guard has protected the waters of Alaska and the people who use them. One of the U.S. military's five service branches, the Coast Guard is responsible for maritime rescue, drug interdiction, smuggling prevention, humanitarian-aid distribution and fisheries patrols. This edition of the occasional We Alaskans feature, Alaska by the Numbers, looks at the Coast Guard in Alaska, including well before statehood. 47,300: Miles of Alaska shoreline the 17th District of the Coast Guard, based in Alaska, is responsible for monitoring. 2,500: Total active duty, reserve, civilian and auxiliary Coast Guard personnel in Alaska. 14: Coast Guard cutters based in Alaska, using ports in Kodiak, Juneau, Ketchikan, Homer, Valdez, Cordova and Seward. 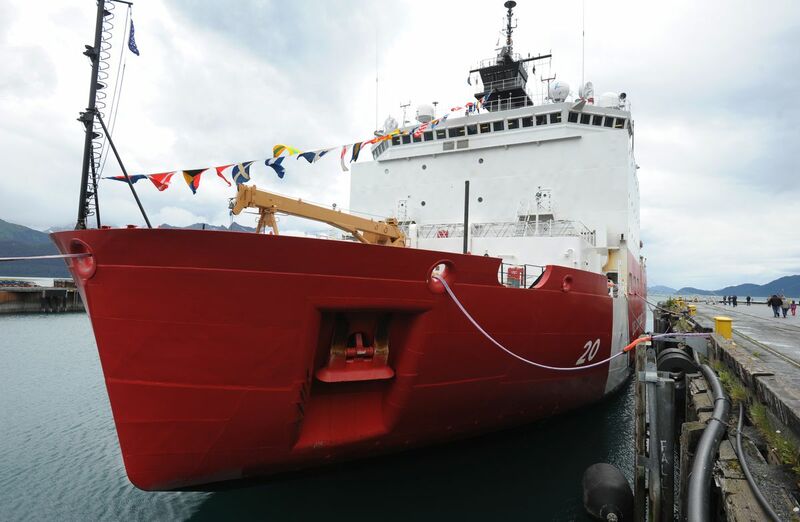 The Coast Guard cutter Maple, which had been ported in Sitka, recently crossed the Northwest Passage to a shipyard in Baltimore. 17: Aircraft in Alaska, including HC-130s, an extended-range search-and-rescue version of the C-130 military transport aircraft; MH-60Ts, twin-engine, medium-range helicopters that can fly a crew of four up to 300 miles offshore and hoist up to six more people onboard; MH-65Ds, short-range recovery helicopters that normally carry a crew of four, a pilot, co-pilot, flight mechanic and a rescue swimmer. 7: Pilots, along with 30 crew members, assigned to Air Station Kodiak when it was commissioned in 1947 as the first permanent Coast Guard air station in Alaska. 6: Number of sailors aboard 738-foot cargo ship Selendang Ayu who perished in 2004 when its engines failed in stormy Bering Sea weather. Two Coast Guard HH-60J Jayhawk helicopters dispatched from Kodiak rescued most crew members, but a rogue wave broke over the ship's bow, with the spray causing one of the copter's engines to fail and the aircraft to crash. A nearby HH-65B Dolphin copter rescued the three Jayhawk crew members — but only one of the seven members of the Selendang Ayu crew. Later, members of the Dolphin crew were awarded the Distinguished Flying Cross. 1: Number of lighthouses in Alaska operated by the U.S. Lighthouse Service when the territory was purchased from Russia in 1867. That lighthouse, in Sitka, was located in the cupola of the Baranof Castle. It had a seal oil lamp and a large reflector. 100,000: Dollars appropriated by Congress in 1900 to establish 11 lighthouses in Southeast and four on the western coast. 519: Passengers and crew aboard the cruise ship Prinsendam who were rescued after the vessel was disabled by fire in the Gulf of Alaska in 1980. Helicopters and motor lifeboats helped ensure everyone was saved by Coast Guard, Air Force and Canadian rescuers — even though the ship was 129 miles from land. 44: Years that U.S. Coast Guard cutter Bear conducted rescues, helped scientists, and enforced the law in Alaska waters, ending in 1929. 64: Days it took for the 230-foot Coast Guard icebreaking cutter Storis and 180-foot buoy tenders Spar and Bramble to cross the Arctic via the Northwest Passage in 1957 — the first American ships to make the passage from the Pacific to Atlantic Ocean north of the continent. 118: Percent increase in maritime traffic in the Bering Strait from 2008 to 2012. 10: Months between supply runs to two of the most-isolated lighthouses in the United States, the Alaska duo of Scotch Cap and Cape Sarichef, in 1912-13. Due to the difficulty of being posted there, the keepers earned one year of leave every four years. 13: Average number of security boardings members of the 17th District of the Coast Guard make in an average month. 9: Average number of pollution incidents the 17th District responds to in a typical month. 4: Number of seasons the reality TV show "Coast Guard Alaska" ran on the Weather Channel — premiering in 2011, ending in 2015. 95: Millions of box office dollars the 2006 film "The Guardian," starring Kevin Costner and Ashton Kutcher, earned. The story is based on the elite rescue swimmers of the Coast Guard's Aviation Survival Technician program, which is based in Kodiak.